The new season has been unveiled and many thanks to all the skilled and not so skilled painters and gardeners that helped spruce up the club on Good Friday. While we were busy on the outside the builders were inside putting new tiles in the revamped showers and painting the hall. I am confident that you will be able to see where the Covanta grant money has been spent once the builders have finished and the cleaners have completed their work. However, the hall will still need a bit of work over the next couple of months with new windows and doors fitted and a new wooden floor laid so I would ask you to excuse any defects you might see for the moment! We have also done a lot of work on the ground with tons of sand, seed and fertiliser covering the outfield and some of the old turf dug up and new turf in place. The ground looks like an enormous billiard table and Dale hasn’t stopped smiling since he returned from Australia. Mind you, once the 5ths get their feet on the ground I can see Dale’s tan fading rapidly. This weekend sees the first chance for some players to get reacquainted with whatever was left fermenting in the kit bag since last September. On Saturday our Men’s 1st team are in The Vineyard to take on The Hills and this will have certain poignancy as The Hills lost one of their guiding forces in Joe Clinton recently and we send our condolences on their sad loss. By coincidence our 4ths, with Joe Doherty as skipper, will also be away to The Hills on Saturday but this game will take place in Ringcommons. On Sunday, Dale leads the 2nds up Simmonscourt Road to take on Merrion. 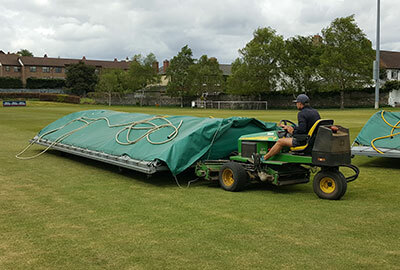 I wish all the teams well and hope to be around to see at least one game over the weekend and I know they will appreciate any support – keep an eye on the weather, it is cricket season after all! The recent passing of Sean Fitzpatrick after those of John Brennan and Michael Fagan last year increases the number of broken links with the Pembroke of the second half of the twentieth century. When I joined the club in 1966, Sean and the rest of the Fitzpatrick clan were well established in the club. Not long afterwards Sean reached the exalted heights of being elected to the Committee !! I think he actually served as secretary for a time. Pearse and Brian did not play much cricket and I never really knew them but I shared dressing rooms with Sean, Eamonn and Derry before his emigration to Canada. Noreen was one of those who got womens’ cricket running again in the club in the 1980’s. She also of course became part of a marriage made in Pembroke with Frank Butler. Todays limited overs players have no familiarity with the timeless cup matches of the sixties and early seventies, where you started on a weekend afternoon and continued on week nights until both innings were complete. Sean would sometimes amuse younger players by remembering opening the batting on a Saturday at 2.00 pm, being out in the second over and taking no further part in the game until 7.00pm on Tuesday. In her tribute read during his funeral, Sean’s sister Nollaig recalled his quirky sense of humour. I have frequently recalled one example of this. While sitting outside the pavilion during a match, both of us out and watching another Pembroke wicket fall bringing our score to something like 50 for 7 chasing 200, Sean observed “we need snookers”. His musical talent was also mentioned at his funeral. I would be confident in saying that he is the only Pembroke member to write a song that reached the final of the National Song Contest. Sadly “Butterfly Morning” did not secure enough votes around the country to reach the Eurovison final but Sean sometimes remembered with affection the midlands voter who gave it his number one . Perhaps Sean’s greatest work for Pembroke occurred from 1986 on. In that year the Selection Committee realised we had a number of promising cricketers in the 14/15 age bracket coming through who needed an introduction to adult cricket. It was decided to start a sixth eleven . Sean agreed to captain it and did so for several years thereafter. In this capacity, he oversaw the development of such players as Ciaran Sharp, John and Peter Davy, Dickson Butler, Stephen Moulton and several others who went on to higher things. Sadly, Sean’s latter days were marred by illness such that he was not a presence in the club for several years. He will always be remembered though by those of us who played with him as someone who played the game with a consuming commitment and strict attention to what is now called the spirit of cricket. I would also like to take this occasion to send on condolences on behalf of the club to Stephanie Barman, whose brother Jake recently lost his partner Jacob while travelling in Cambodia. I know this is such a hard time for both the Fitzpatrick and the Barman families and I hope they will take some consolation in knowing their Pembroke family is here for them. Previous: Previous post: Lords Preserve Us! Next: Next post: Club Clean-Up Day!